So a few days ago I wrote about appetite. that I think if you’ve got it, you would know what I meant. and if you didn’t know what I meant, you might be prompted into thinking a bit more about it. The web is full of self-help stuff. Most of it has a short-term feel-good factor but it’s rare that things we read stay with us the long term. we’ve got to do the work. And we’ve got to be clever about it. The thing about appetite, is that it can be whatever you feel it means to you. You may define it as ‘drive’, you may define it as ‘effort’, or ‘talent’. But I’ve known many talented people who never complete things (that’s ok - it’s no judgement - do what you want to do), but I mention this just to illustrate that having talent alone doesn’t make someone a great photographer. Neither does working hard. I’m not a big fan of the 10,000 hour view that if you put enough time into something, you’ll get better. You can spend a lot of effort running in a circle. I think good artists are self learners. They are able to use their time to learn from themselves as they go along. I’d dare to say that most great artists didn’t get to where they are because of an art class they took. Sure, the art class will have given them skills and new ways of working, but they had to spend the time and effort joining the dots, making the connections and finding their own path. In other words, at some stage : they took hold of the responsibilities of their own development. That’s the appetite I’m talking about. Having the aptitude to grow is one thing, but wanting to do it badly enough is another thing entirely. If you really want to improve in your photography then there are no shortcuts. No quick fixes, no instant results. We all have to do the work. And we have to have the appetite to do it. Everyone is hoping to improve their photography skills. Skills can always be learnt. But there is one thing that is much rarer than skill, and it’s something that can’t be learnt. I know, trees are such a cliché aren’t they? But I think that often a photograph isn’t about the subject. It’s about the treatment. It’s about the sensibilities applied. Everyone can take a photo of a lone tree. But what we should be aspiring to, is to convey a level of excellence, of elegance, of beauty that is above ‘just another picture of a tree’. Doing what everyone else is doing means you just disappear into a sea of sameness. But you can avoid it, I believe, if you try to set your work apart in some way. Often that can happen, not by the subject matter you choose, but how you choose to shoot it, and how you choose to edit it. Often the excellence is in the execution of the work. I’ve just had to accept that certain landscapes are what they are. They have an uncanny knack of knowing how to direct you: they tell us what needs to be done. We just have to listen. Therein lies the problem. Most of the time we don’t listen to what the landscape is telling us. Instead, we often try to force upon it what we want. What we are looking for. Instead, we shouldn’t be looking for anything. We should be a clean slate, ready to work with whatever conditions we are given. How many of us go to places with pre-visualised expectations? Hoping to get a certain shot we’ve seen before, or the same conditions? I’ve been having problems this past year with my use of colour. Or perhaps the lack of it. I was very happy to find that my South Korean image had quite a bit of colour in them. I feel there’s been a pendulum-swing as I’ve gone from reducing colour further, and then further still, to feeling I’m starting to re-introduce it into my work. As you can see above. These images may ‘appear’ to have little or perhaps no colour to you. All I can say in my defence is : it’s what the landscape directed me to do. I can’t make the landscape be anything it isn’t and rather than have an up-hill struggle to make it so, if I follow what the landscape tells me, things just tend to ‘flow’ much easier. Hokkaido is not a landscape of strong colours. But it does have them. 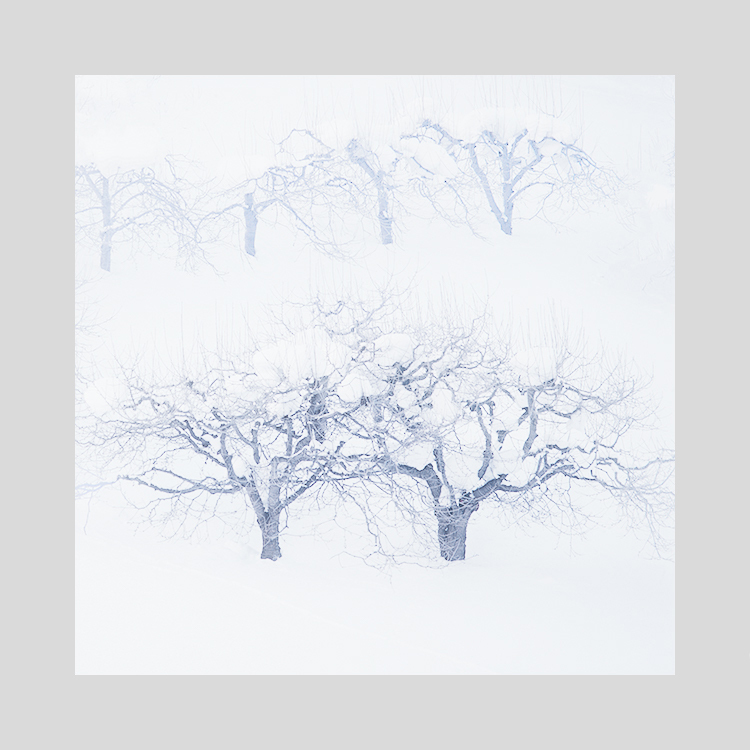 I think the art in making good photos of Hokkaido isn’t necessarily about working with negative space. Neither is it about working with snow scenes only. I think it’s about working with tone and colour responses. These are where the emotion of the picture reside. Snow is not white. Neither is it just one continuous tone. 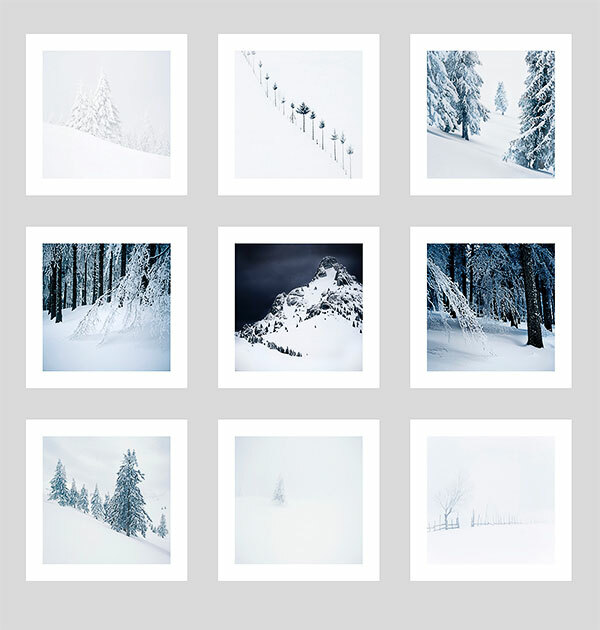 Snow is a vast array of off-whites, with subtle graduations running through the landscape. 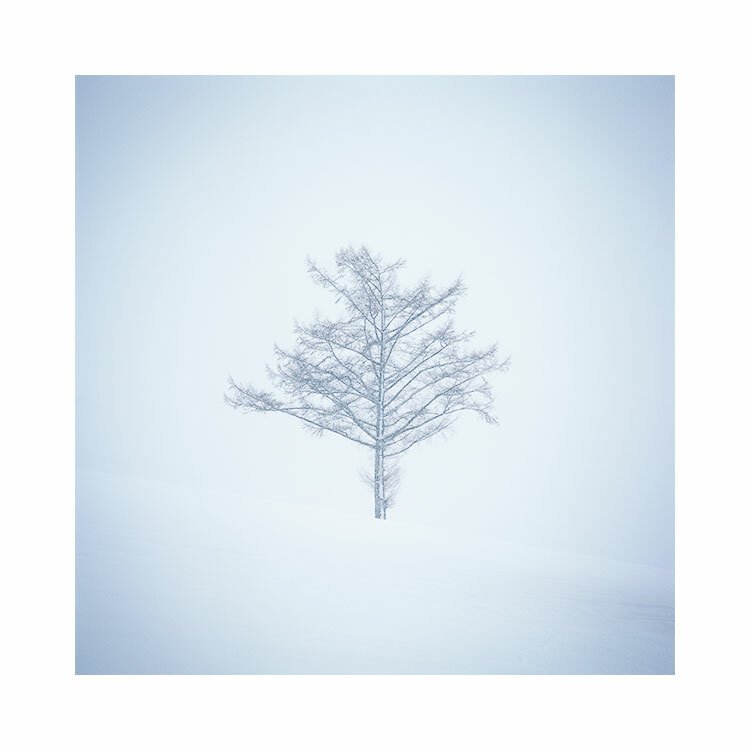 Our eyes are often blind to these subtleties as we start to photograph it, but with some well informed time behind the computer monitor editing and reviewing, we should all come to learn that white has a tantalisingly vast array of shades and off-white colours. Hokkaido has been my director. It has guided me in my lessons over the past four or five years. I’ve learned so much from working in this landscape when I have chosen to listen to it. I was laughing to myself when I saw this. It was simply too good to be true. Too symmetrical, too balanced, too orderly. Too close to an idealised view. I believe that photographic work becomes stronger if there is a concept behind it. Concepts can be whatever you want them to be. There are no rules. There shouldn’t be. I have a dear friend from Massachusetts who tells me ‘You know Bruce, you seem to be able to go anywhere in the world and take the same photograph’. He is of-course right. But I do hope it was intended as a compliment as I think it is. I think what Steve was telling me was ‘you have a style’. But there is more to this than meets the eye. I do like to focus on certain concepts or themes, and it is not unusual for me to shoot the same scene in numerous variations. I even publish these variations in the same collection. Which leads me to another interesting comment I sometimes hear from viewers : ‘what is different between these two shots?’. The answer should be plainly obvious to us photographers: they are compositional variations. Rather than just picking one to publish, I sometimes can’t decide, as I feel each variation has something to say its partners do not. Repeating themes in the work also makes the work thematically stronger. The work becomes greater than the sum of its parts. But the trick I feel, or the talent in working with themes, is in finding them to begin with. It takes a rare eye to be able to see a theme in something that others may pass over as mundane, or in the case of some of my more recent Iceland images, landscapes that look quite close to being man-made quarries. Themes can also go beyond a body of work, and leak into adjacent projects. You may find over time, that you have a propensity to steer towards certain subjects, or tonal responses. Again the trick, or ‘talent’, is in recognising this in yourself and your own work. I feel that all too often photographers don’t ask themselves ‘why’, or ‘how did I create this?’, or ‘why did I create it?’. Too many of us are just busy making pictures without joining the dots, without recognising themes or variations in what we do. We are missing clues that can help drive us forward in what we do. We have to keep returning to the landscapes we love, so we can get better at shooting them. Returning time and time again allows us to dig deeper below the surface and to familiarise ourselves with how the landscape works. On my first visit to Hokkaido, I was lost. The landscape was nothing like I had imagined. Lost in pre-visualised ideals of what I thought I would see, I learned that turning up to a landscape with any preconceived notions does not help. Hokkaido is not this simplified fairytale minimalist place I had imagined, but is instead a densely industrialised island that requires a lot of time and effort to find great compositions. I came home from this trip thinking that I may not return as I doubted I got any decent shots from the trip. The ones you see above were, I felt, handed to me rather sparingly. Or more precisely, happened because these were the few moments when I let go, and worked with what Hokkaido was presenting me with, rather than it conforming to what I wished of it. As I’ve continued to return, I’ve learned that the landscape is never the same. More specifically, if there is something I feel I missed on a previous trip, it’s rare that I will be able to capture it on a further visit. I never see the same conditions present themselves more than once. Instead I find I just create a set of images that add on to the ones I shot previously. Landscapes offer up something new on each return visit. I’ve never understood it when someone says ‘Iceland’s been done’. A landscape is never done. Perhaps the conventional view has been made several times, but it is never done. A statement like this says more about the photographer’s limited knowledge than it does anything about the landscape. Nothing is ever the same. We may go back hoping to capture that elusive shot we missed the previous time, only to find that we are being offered up something new instead, and it is our skill in working with what we are presented with, that is key. There is also the aspect of learning from a landscape, which can go a long way to helping us improve our own photography. Spending time with the same place will show us more about who we are, and how we approach our craft. We should banish the thought that returning allows us to get more pictures. Sure, of course this may be true, but to think photography is about quantity rather than quality is to forget oneself. I think we often think of the landscape as an inanimate object, something that we view, and if it doesn’t offer us anything, it is the landscape’s fault, not ours. This is really an upside down view of what landscape is and what it does for us. Landscapes tell us more about who we are rather than what it is. If we can’t ‘get’ a landscape then the problem most probably lies more with us than it. The landscape is what it is. It has no knowledge of what you want it to be, and in doing so, it teaches us to be more willing to work with what it offers. Any preconceived ideals we hold, constrain us more than it constrains the landscape. Returning time and time again, offers us a chance to learn. It offers us a chance to understand that the landscape has many sides to it, and the skill is in us working laterally, going with what it presents us with, rather than forcing it to work to our own ideals. Returning time and time again, also allows us to dig deeper, to hopefully assimilate and build upon what work we have created in the past. Good photography is all about putting the effort in and returning time and time again. It is like mining for gold. We never know when the next great image may come, and they will only ever come if we are out there. As the adage goes ‘if you don’t go, you don’t get’, and of course ‘f8 and be there’ also springs to mind. In a short while, I will be announcing a new book about the south American atacama. The book encompasses photographs from the Argentine, Bolivian and Chilean high plateau. It has been a work in progress for around 8 years. I had the 'working title' for this book earmarked around six years ago. I find titles a great way to conceptualise and to think about which way to steer my creativity. 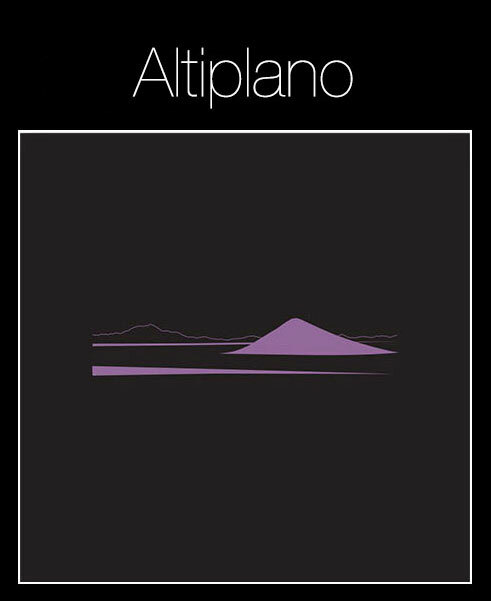 Once I had the title 'altiplano', I felt I knew what should be in the book, but also perhaps more importantly - what shouldn't. The proposed title for my future central highlands of Iceland book. I hope to publish this in the next year or two. I find projects or themes a great way to steer myself forward. My creativity is more focussed once I have the 'correct' theme in mind. But the theme doesn't always surface straight away and I find that 'working titles' can morph into something else if I live with them for some time. 'Working titles' are like clothing: you try them on for size and to see how they feel. You need to wear them for a while to see if you grow into them or to find that they really don't suit at all. Altiplano was one title that stuck from the moment I had it. It made me realise that I couldn't add in other landscapes from around Bolivia - I had considered the mines and some other areas but they weren't part of the region that is defined the altiplano. Boundaries are important in focussing attention. I don't know if I've discussed this on this blog before, but my graphic designer friend Darren and I have been playing around with themes and designs for a set of books. The first of which is coming out soon. We pretty much hope to publish a further two books over the next few years. I'm hoping to publish one about the central highlands of Iceland - this will be a book with no 'popular' landscapes in it. No classic waterfall shots, etc. It's all about the remote interior, and I hope for it to include my images from my winter shoots in the interior, and also the dark landscapes I encounter throughout the rest of the year. The proposed title for my Hokkaido book. The other is about Hokkaido. You can see 'mockup's' above. I wouldn't take the designs or titles too seriously right now - I'm showing you these to illustrate the process I go through - these are just 'working titles'. Hálendi means 'Highlands', and Shiro means 'white'. Just working titles and it's too soon to say whether they will stick. What these working titles give me, is a way of visualising the final books. I've already been collating the work from each landscape, and I've managed to choose around 50+ images so far. But I can already see gaps in the work - areas where I need to look for images to fill out areas of the landscape that I have either missed out on at times in the past, or that I know are still there to be photographed. Working titles are a great tool to help steer you forward. Making individual photographs isn't enough. If you find yourself feeling rudderless, not sure where to go with your photography, but at the same time know that you are creating good individual images, then I would suggest you need a concept: something to help you glue your work together. The whole is always greater than its parts, if you get a really strong theme or 'working title'. It can propel you and give your creativity focus.